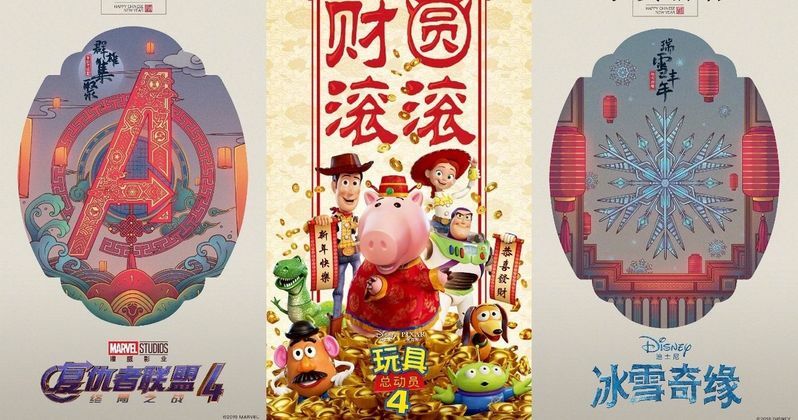 Disney has released a slew of new posters in honor of Chinese New Year for their 2019 blockbuster movie slate. The studio had a record-breaking year in 2018 and they're looking to continue the hot streak again this year with several major sequels and a few remakes of animated classics. While most people were, understandably, focused on what trailers dropped during the Super Bowl, the Mouse House also released these very stunning posters as well. The posters cover the majority of their upcoming slate (save for Star Wars 9), both live-action and animated, including Captain Marvel, Dumbo, Avengers: Endgame, Aladdin, Toy Story 4, The Lion King and Frozen 2. Those 7 titles could, quite easily, wind up being seven of the highest-grossing movies of the year, when everything wraps up. At the very least, it's not hard to imagine the majority of these titles landing in the top ten. Laid out like that, it's easy to see why Disney has been so dominant in recent years, and will continue to crush the competition, in the coming years. Perhaps more importantly, it gives moviegoers a lot to look forward to. As for the posters themselves, they're all done with Chinese lettering, with the majority featuring a grey border with a very minimalistic but stylish image at its center. The exception is Toy Story 4, which features the gang gathered together on a more colorful and slightly more traditional-looking one-sheet. In any event, they're all quite nice to look at and are a welcome break from the usual overly Photoshopped posters we so often get from studios these days. For what it's worth, due to their minimal nature, none of the posters reveal much of anything about their respective movie. So those hoping to learn anything about Avengers: Endgame from the image need not concern themselves with a painstaking search of the image for clues. Things are about to ramp up for Disney in a big way next month. Captain Marvel, the first female fronted solo title in the Marvel Cinematic Universe, arrives on March 8. The studio spent the money to give Brie Larson's new hero some time to shine during the Super Bowl. They also showcased spots for Avengers: Endgame and showed a full trailer for Toy Story 4 after the game. They didn't, however, spend the money on Tim Burton's live-action Dumbo, which arrives quite soon, just behind Captain Marvel, on March 29. The other two live-action remakes, Aladdin and The Lion King, also didn't get Super Bowl spots, but we'd expect to see new trailers for both titles sooner rather than later. In the case of Frozen 2, which is slated to arrive on November 22, we've seen nothing at this point, not a scrap of footage. But all in due time, as the studio has a lot of movies to promote. Be sure to check out the newly released Chinese New Year posters from Disney below.